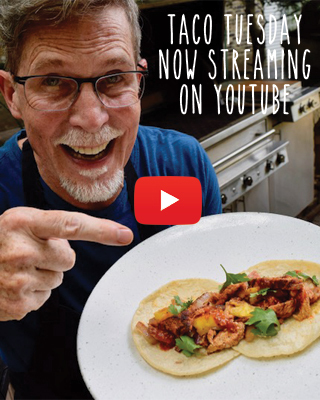 Rick Bayless | Tickets to the 2014 Dinner Like No Other are now on sale! Tickets to the 2014 Dinner Like No Other are now on sale! 1. It’s a once-in-a-lifetime opportunity to experience food that Rick and his chefs have never made before—and will never make again. 2. Tickets sell out fast. This year, the dinner takes place on Sunday, June 22, 6pm, at Frontera Grill. Like always, the challenge to Rick and his staff is to create six never-before-seen courses featuring early summer produce, meat and fish from local farms and producers. The challenge for sommelier Jill Gubesch: Pair these dishes with unique, delicious wines. The night includes a robust auction and raffle and the opportunity to meet some of the farmers that have benefited from Foundation grants. A bottle of Frontera Grill Private Reserve Tequila from Casa Herradura (not available to the public). VIP tickets ($475 for both the reception and the dinner, including tax and gratuity) are very limited; general admission tickets ($175, including tax and gratuity) are slightly more available but also sell out quickly. All proceeds benefit the Frontera Farmer Foundation. To reserve your spot, call 312-661-1434. I believe The Frontera Grill is in Chicago…I may be mistaken, but you can telephone them. is the menu going to be of mexican style or more like last year? The menu isn’t set yet, but it usually strays a bit from Mexican. So, more like last year. Where does the “Dinner Like No Other” take place? At Frontera Grill, here in Chicago. Same question I have, what city or state is this being held in? This event is always held at our restaurants here in Chicago. This year it will be held on June 14th. This year the event will be held here at our Chicago restaurants on June 14th! Is this like a sit-down dinner or appetizers/ cocktails? Can you please tell me when the tickets will be available for this years event? I am very interested in tickets! Most likely we will be selling tickets starting middle of May. If you join our mailing list (bottom right side of our website) we will send you an email when tickets go on sale! As an octogenarian, 82, it is not prudent to plan too far in advance. However, your show “One Plate at a Time” is outstanding. Great creative cooking, excellent showmanship, delicious results. My esposa, Betty and I, have been all over Mexico — except Oaxaca. Your place and Oaxaca are high on our “Bucket List”. We moved a Southern California medical company to Oklahoma City years ago. Great place and great people. One final accolade: Your interactions with your friends, diners and Mexicanos is admirable. Keep the imagination going in your creations. (Trying a Mescal Victoria Highball tonight). Much appreciation! The event must be sold out. Left a message inquiring about tickets over a week ago and never heard back.